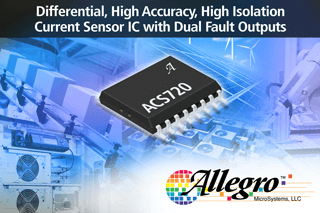 Allegro MicroSystems, LLC introduces a new high accuracy Hall-effect-based current sensor IC with multiple programmable fault levels intended for industrial and consumer applications with a focus on motor control and power inverter stage applications. One of the key benefits of Allegro’s ACS720 is to provide high isolation with a reduced bill of materials made possible by the proprietary IC SOIC-16W package. The ACS720 works off of a single 5 V supply while maintaining an output voltage swing from 0 to 3 V, with a stable zero current output of 1.5 V. This allows the ACS720 to operate off of a 5 V supply while having an output which is compatible with typical 3.3 V ADCs found on many MCUs. Furthermore, the ACS720’s high PSRR rejects the noise often found on the supplies in the power section of the PCB or system, maintaining high accuracy in noisy environments.The device has dual fault functions that are user configurable. Fast and slow fault output allow for short-circuit and overcurrent fault detection. A user-created resistor divider from the power supply of the ACS720 is used to set the fault level. The fault outputs are open drain, allowing the user to pull them up to a compatible voltage for the MCU. The open-drain outputs also allow for implementing a simple logical OR of multiple sensor fault outputs.